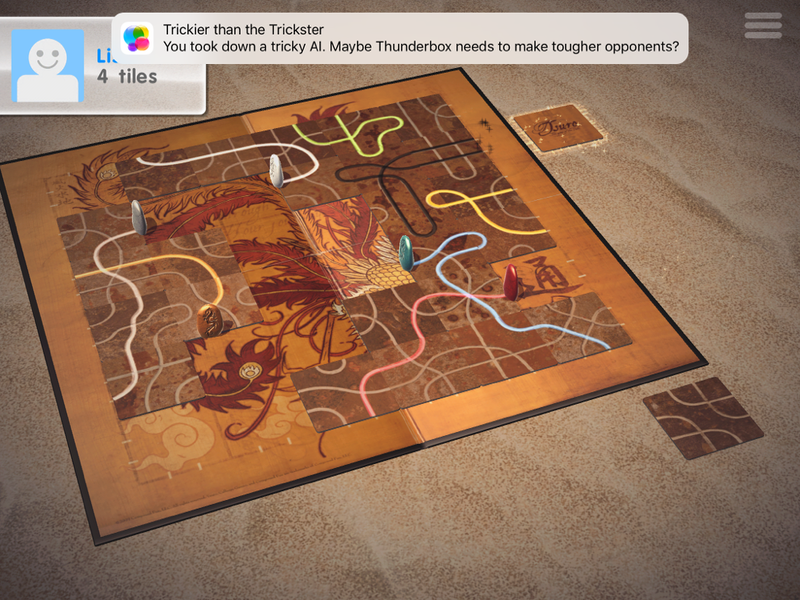 Tsuro, “the game of the path,” is a laid back board game that’s been adapted for iOS devices by Thunderbox Entertainment. I knew next to nothing before playing it, but the simple rules pulled me in right away. They’re very easy to understand, as there isn’t all that much to know. But it does take some strategy and cunning to win against other players. The game does a good job of explaining how to play through its tutorials, but there were a few things I missed. There are eight stones on the board and a stack of tiles, which I keep calling cards. Each player chooses a stone and moves it to one of the starting positions along the edges of the board. Once all players are in place, you tap the deck to start the game. Each player then takes turns choosing a tile from the three they were dealt. They place the tile in front of their stone, which creates a path for the stone to follow. The original goal of the game is to keep your path going as long as possible, with the winner being the one who stays on the board the longest. Things get interesting when you realize that if two players are facing the same spot at the same time, the person who chooses the card has the power to sabotage the other player. 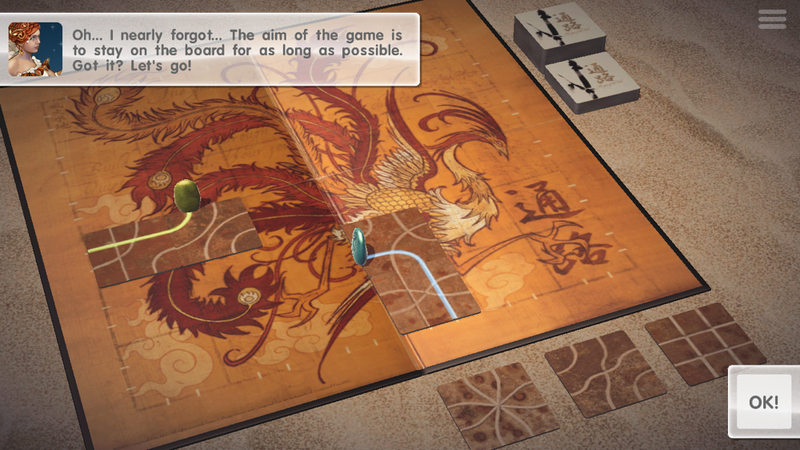 When a player’s path sends them to the edge of the board, they’re thrown out of the game. So the strategy is not just in managing your own path, but seeing how you might control another player’s path. It adds a lot of depth to a seemingly simply game. What I missed at first is that you can change the objective of the game. There are three different modes you can play in — the original as I explained above, longest path, or most loops. The different modes are depicted simply as icons. I saw said icons but didn’t know what they do, so I ignored them. Once the developer explained them, though, I started using them a lot. They give the game a lot more replay value, as you practically have three different games in your hand. 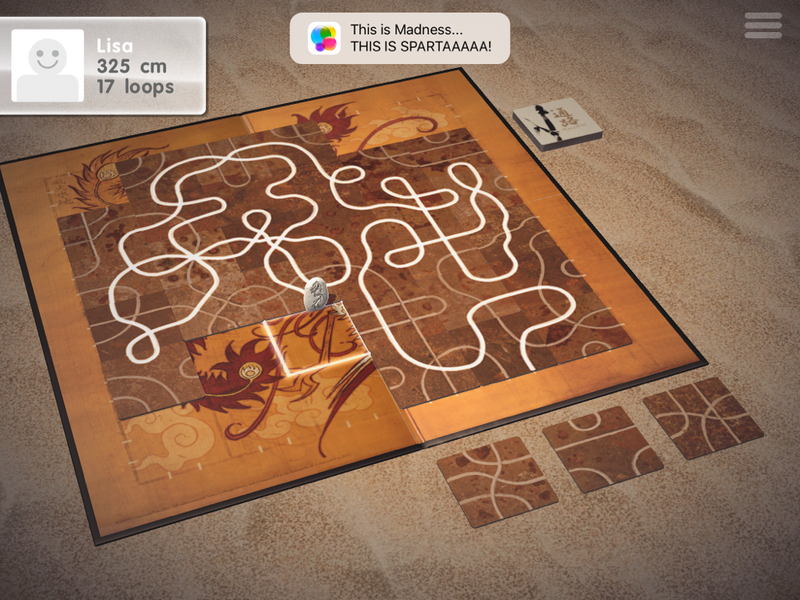 I actually prefer the longest path and most loops modes, which weren’t part of the original board game — probably because it would be too difficult to count up the length or loops without a computer to do it for you. You can play with up to seven friends (eight players total) using the same iPad, passing it around to each person. You can also play solo and try to create as many loops as you can, or create a longer path than you ever have before. While the solo game is enjoyable and there are leaderboards for it, it doesn’t have much lasting power. I also played against AIs, which was definitely more interesting. But the most fun I’ve had was playing with a friend in person and including a couple of AIs in the mix, or playing with friends over Facebook. Unfortunately, the game does not have multiplayer over GameCenter. If you don’t have friends to play with in person, your only option for multiplayer is Facebook. I didn’t have Facebook friends who own the game, so I added a couple of the developers and some other players as friends. The game really opened up once I had a few people to play with. I don’t like sending game invites to friends on Facebook to try to get them to buy or download a game, so I understand if anyone has reservations about that. If it bothers you, I would recommend just creating an account specifically for games and finding people to play with. I’m always open for a game, so feel free to add me as a friend on Facebook. If you do play over Facebook, keep in mind that the game doesn’t offer any way to communicate. So you may want to keep some other channel open to chat about the game. The developers thought of a lot of things to make the game more user-friendly. For instance, there’s a “Turbo” mode which speeds up the animations if you feel you’ve seen enough of them. In that mode, you skip the box-opening sequence and get straight to the game. Each turn also moves faster. It’s a welcome feature that I switched to fairly early, since I’m a bit impatient. They also made sure that Facebook games sync to multiple devices as long as they’re both linked to the same account. It might seem at first that they don’t sync, since your opponent needs to make a move for it to show. But I tested it even with the game open on both devices at the same time and I got the notifications on both. That means you can start a game on your iPad or iPhone and continue it on the other. Solo games are still tied to the device you start on, but that’s not a big deal, since no one’s waiting for you to take your turn. Being able to swap devices for the multiplayer games makes a world of difference, though, and I’m so glad they thought to include that. 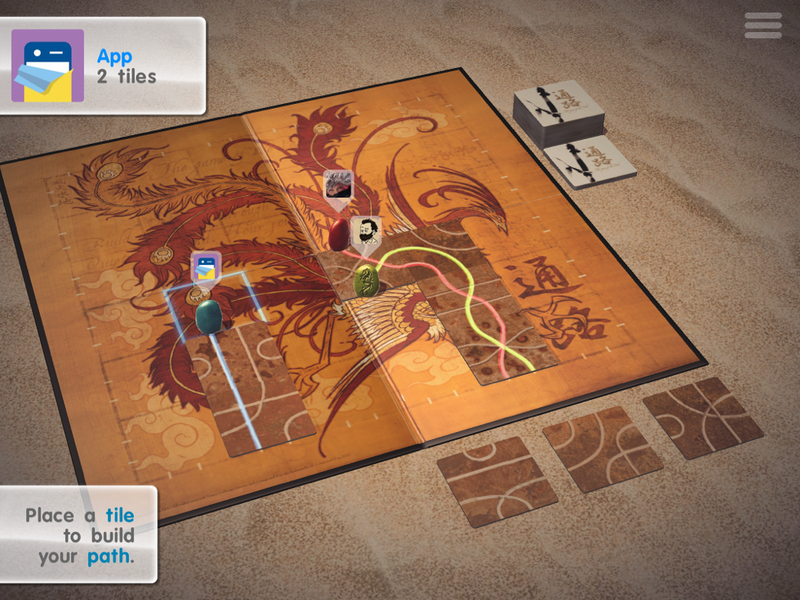 Tsuro is great-looking game, with each stone forming a different colored path. It’s also in 3D, making it feel like a real board game. 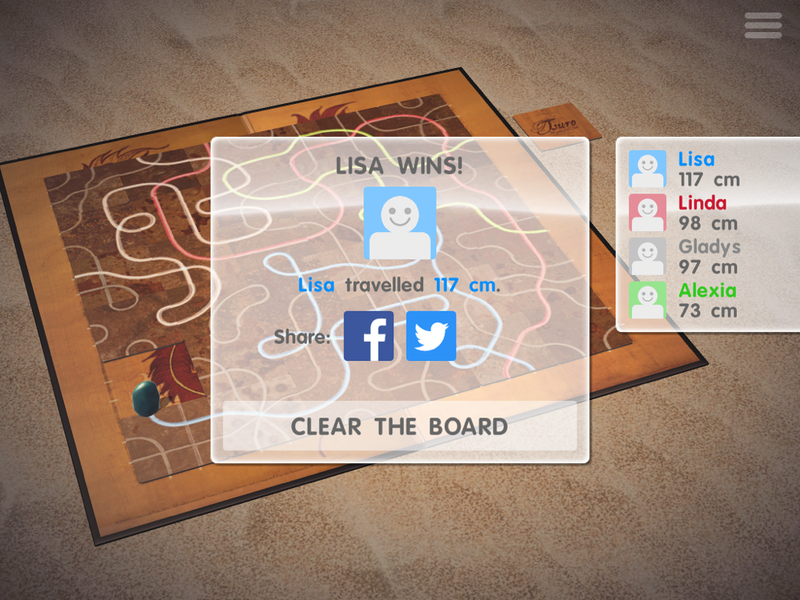 But I would have liked to see a top-down 2D version of the board, especially on my iPhone. The small screen can make it hard to see the board clearly in its current 3D form. Thankfully, you can still tug at the board to change the vantage point a bit. It doesn’t stay that way, though. Perhaps simply giving the user full control over the camera would be a good solution. There are also buttons for posting the final board to Facebook or Twitter. The colored paths often look like art, so this is a great feature to have. Unfortunately, the stats and share screen cover the completed board, so there’s no way to take a screenshot of it. I think a single “share” button would be preferable to the Facebook and Twitter buttons, which would then lead to options like Facebook, Twitter, Instagram or just saving the photo to your album. A lot of games do that and it would be a nice way to get a screenshot of the final board. I also appreciate that the developers added a lot of humorous achievements to the digital version. I haven’t been specifically trying for any yet, but I have chuckled a bit when the game congratulated me on playing with a friend or being consistent and choosing the same stone for every game. There are fifty-five achievements to earn, some of which are hidden. I look forward to trying to get them all, as I’m surprised they could even come up with so many for such a seemingly simple game. I do have a small complaint about the game playing over Facebook. Games I’m in middle of will sometimes disappear, only to return after my opponent makes their move. All games in progress are supposed to be visible at all times, so I’m not sure why that’s happening. It is a little confusing, because it makes me wonder if the other player deleted the game. But it’s still a minor issue. Thankfully, you can have multiple games going at the same time with the same person. You can also include friends in a game even if they’re not friends with each other. That means if you don’t have a lot of friends playing, but you have a friend who does, they can invite you to an eight-player game. But be warned — a game with eight players all playing in bits throughout their day can take a long time to complete. Currently, the Facebook games can only include real people, no AIs. But the developer said they’ll try to add AIs to Facebook. That should add some excitement to the one-on-one Facebook games, as AIs take their turns immediately. Two players seems like the surest bet for Facebook until AIs are added to the mix. If a game does take a long time to play through because I’m waiting on people, it’s not the end of the world. 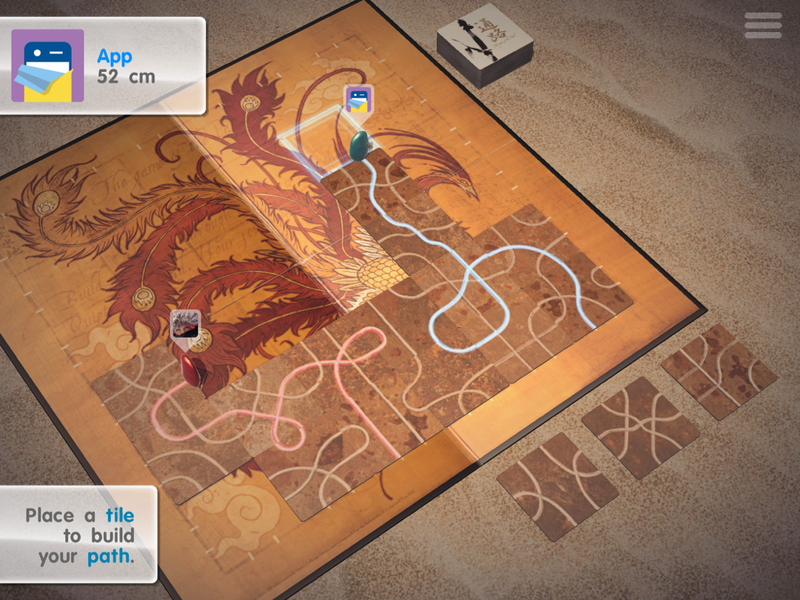 Tsuro is not a game I would want to play non-stop for hours on end, anyway. I like to multitask with it when I’m either watching a movie with a friend or watching TV on my own. It makes sense to just have a bunch of games going on with different people so if one is off playing Fallout, you can still play the other games. Unfortunately, you can’t switch between a solo game and multiplayer games. If you’re playing s solo game, you need to finish it or clear the board in order to take your turn in a multiplayer game. It’s not ideal if you want to play a solo game while waiting for your friends to make their moves. The only way around this is to use two different devices and keep your solo game open on one. There also seems to be some balancing issues with the rules in the two alternate modes. The game won’t let you run yourself off the board, even if there’s a really long path or one with some loops. The goal of the original game is to simply stay on the board the longest, so it makes sense that the game won’t let you commit suicide. But I wish the rules would change in the other two modes to adjust for the objective change. I should be allowed to sacrifice my stone if I see a potential winning move. In fact, I’ve won games even though I was kicked off the board early, simply because I had a good run for the first half of the game. While it sounds like I may have a lot of complaints, they’re all small ones. The game could use a few improvements to make it even better, but that doesn’t change the fact that it’s a fantastic, well-made game that I’m grateful exists. I didn’t know until I was playing it how much I needed it in my life. 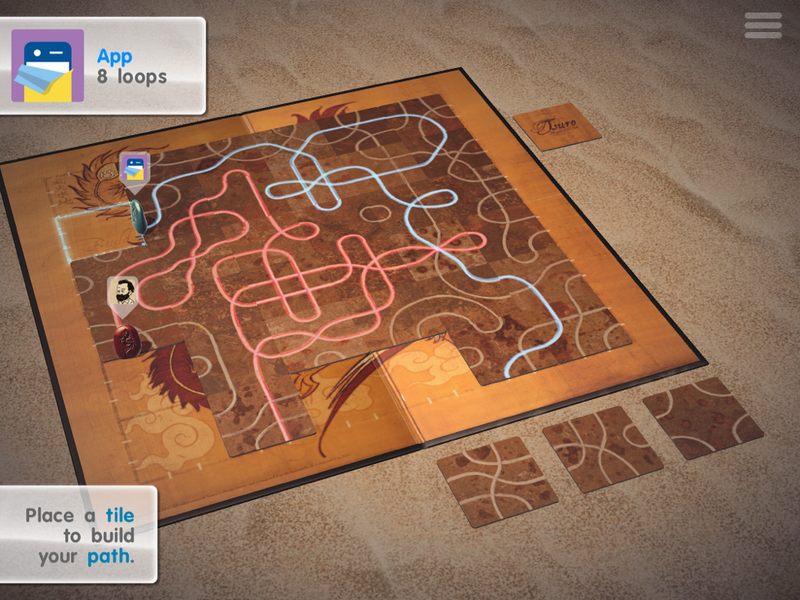 Tsuro is the perfect relaxing game for when you want to think a bit but not stress yourself out. I can’t recommend it highly enough if you have friends to play with either in person or on Facebook. Playing solo does not have as much staying power, but I do appreciate that the developers added ways for the game to be enjoyed that way. There’s only so far trying to beat your own score can take you, and playing against AI alone feels kind of sad for the long term. It’s fine for a few rounds here and there, but the real meat of the game is against other humans, with occasional AI players to add some extra excitement. If you have any interest in this game, and particularly if you like playing board games with friends in person, the iOS version is even better than the physical game in some ways. It only costs $3.99, and on top of that, there are three different ways you can play. Counting loops or distance would be difficult using the physical game. But since the computer can add all that up automatically, it makes it easy to play with the other two objectives, not just the original of who remains on the board longest. I actually find the alternate modes of playing more interesting, because they make each and every move feel more important. If you have any interest in games like this and think you’ll have the opportunity to play with friends, I highly suggest getting Tsuro. You can download the game here. 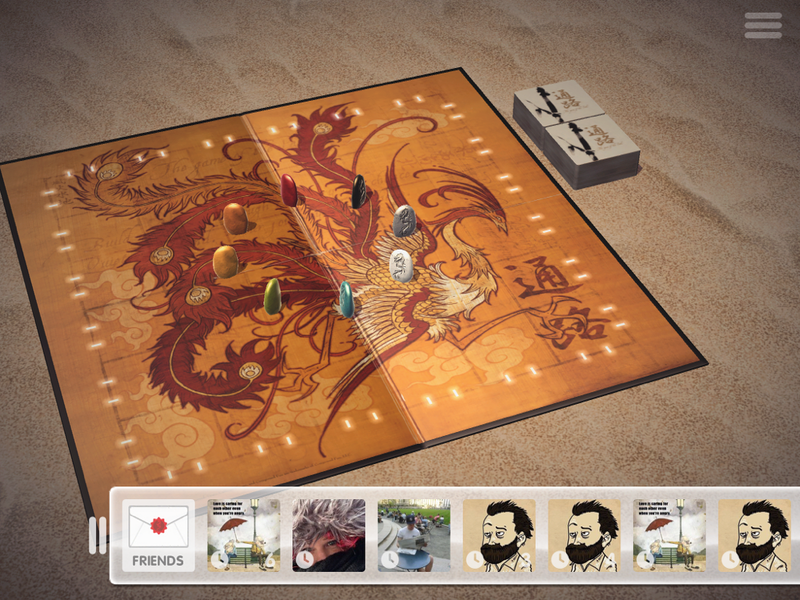 Note: Tsuro is currently only available in some countries. It is being released in other countries as the game gets localized. Previous PostTwofold, Inc. Review: Do You Feel Lucky, Punk? The Japanese word is 通路, meaning pathway, with a long “u” so I wish they had written it Tsūro. Oh really? Didn’t know that. I imagine they wanted to make it easier to search for? Not sure how the App Store treats letters with accents. 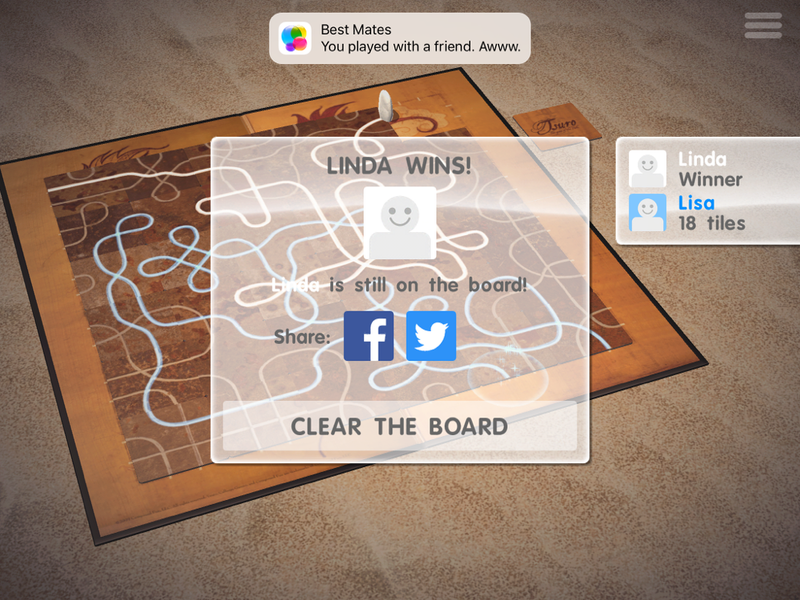 I created Facebook community page, Tsuro Friends, for those looking for friends to play Tsuro. Feeling somewhat stupid. Just discovered if you go to the Leaderboard in the game you can find players to send friend requests to. Their FB names are visible? Usually it only shows the nickname to strangers. It appears to be nicknames until a Game Center player accepts. Then often another normal name appears, but they aren’t Facebook friends. I’m just figuring out Game Center as I’ve only played with real FB friends before. I seem to be able to send challenges but can’t seem to initiate a game with someone from Game Center. Yeah, the game doesn’t have GameCenter compatibility for multiplayer. P.S. I figured out if someone downloads the app via Family Sharing you can’t play with them. I don’t know if that holds true for all apps or is a problem with Tsuro. When you join a Family via Settings, iCloud you can see and download items from each family member’s purchase history, and enjoy them on your own devices. You can download apps to any devices that you own or control. You can download music, movies, TV shows, and books on up to 10 of your devices, five of which can be computers. Tsuro says it supports Family Sharing, but this is the first time I’ve tried it so I don’t know if the behavior I’m experiencing is normal. Ahh ok. Sorry, I don’t have much experience with that. I would think that as long as each device is connected to a different Facebook account it would work, though? Since there’s no iCloud saves for this game. I think I was about to win another game and it just disappeared as if my opponent cleared the board to abandon the game. No one won or lost. No record of it either. Hmmm, has this happened to you? I don’t think it’s possible to clear the board unless someone won. P.S. To your question, yes different Facebook accounts. Seems odd to me. I knew from the screenshots I wanted to play this game and I dove in before reading the entire review. So I just learned about the pass and play feature. Doh! But I can’t figure out how to play with the AI. Ahh after you place the first stone on the board, three squares will appear. Just drag as many stones to them to create AI players. I’ve only ever tried the Tricky ones, though. I guess I should’ve READ the hints. LOL! Thanks for all your help.